Was toying around with a Dell t320 with H710P raid card. The system originally had ESXi running a VM environment and just didn’t need the VM server any longer. Went to install the OS to bare metal and ??? Error “We couldn’t create a new partition or locate an existing one…” Mind you this was a freshly installed drive, wiped, partitioned, volume created, etc. So I banged my head against it for a while. tried several options with the iDRAC config. Decided to open her up as one of the blogs mentioned something about an SD Card. Well there was no SD Card, but there was an 8Gb USB drive on the main board to run the ESXi server. Pulled the drive and voila! OS installed to drive with no hesitations. Still find it a little hard to swallow that ESXi was on a pny USB drive and not a nand or other faster ROM. 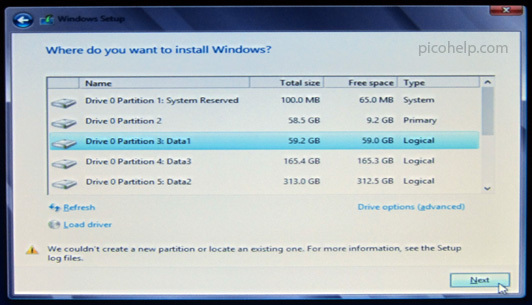 This entry was posted in Self Help, Tech Tips and tagged couldn't create a new partition, server 2008, server 2012, t320. Bookmark the permalink.